Bazaars are bizarre, at least here on the Oregon coast and probably in every small town in America, and they are happening right now as we scramble to buy Christmas presents before it’s too late. I had this plan on Saturday to do all of my Christmas shopping in one day, plus writing out my cards and decorating the house. I didn’t quite make it. Okay, I barely got started. But I did shop. I started my Christmas marathon at the cemetery, switching from the blue flowers on my husband’s and in-laws’ niches to the Christmas flowers. That put me right in the middle of where everybody was going that day, between the Farmer’s Market, Pick of the Litter Thrift Store, and the first annual Chocolate Coffee Christmas Classic, not just a bazaar but a “holiday expo” being held at Newport Intermediate School. Oh, and the Eagle’s Lodge was having a sale, too. The Farmer’s Market has moved into the big hall at the Lincoln County fairgrounds for the winter (Saturdays, 10 a.m. to 2 p.m.). Inside, I found the usual conglomeration of handknitted scarves, jewelry, photographs, a lonely author hawking his books, bread, pizza, produce, plants, homemade jam, and miscellaneous art made out of wood, glass, shells, and rocks. Pick of the Litter, one of the best thrift stores around, supports the Friends of the Lincoln County Animal Shelter. Also at the fairgrounds, it was jammed with people perusing its collection of used clothing, books, CDs, kitchen supplies, and doodads of all sorts. Some were also buying copies of the FOLCAS calendar, featuring local pets. My Annie’s picture is in the upper left-hand corner of November 2013. The Eagles Lodge sale on Olive Street, held in the dark meeting hall, was more like a garage sale. Paperback books for a quarter, Avon jewels and potions for “best offer,” handmade ornaments and more scarves. Pretty low key. The star of the day for me was at the Chocolate Coffee Christmas classic. The intermediate school parking lot was jammed with cars as I parked and made my way past the donation station. Proceeds from from the expo benefitted Lincoln County School District’s HELP program for homeless students, the Newport Food Pantry and the Samaritan House homeless shelter. Picture this: booths offering chocolate samples and coffee everywhere you look, interspersed with other booths offering candles, Christmas tree ornaments with nautical themes, scrapbooks, jewelry, coffee mugs, knitted, crocheted and quilted gifts, goat milk soap, glass floats, pop bottles melted into ashtrays, bright orange OSU and green U of O glass business card holders, photographs of beach scenes and sea birds, fabric angels, tote bags and purses, more ornaments, feather earrings, more jewelry, shoppers in spangled baseball caps, and little old ladies knitting, crocheting, beading, gluegunning,processing Visa cards on cardboard-box tables, urging you to taste, taste, taste and buy, buy, buy. And I did, did, did. My bag got so heavy in the first room I had to take it out to the car before I visited the gymnasium. I think it was the candles embedded with rocks that did me in. I only hit a small portion of the sales happening that day. I missed Holiday House on the Bayfront, St. Stephen’s chowder luncheon and sale, the holiday craft sale at the Connie Hansen garden, the 11th Hour Santa Sale in Lincoln City, and the 85th annual Yachats Ladies Club Bazaar. Too much! Now granted, the people on my Christmas list might not want another handknitted scarf or a melted-bottle ashtray or yet another lighthouse ornament. Too bad. We don’t have a mall. We have bazaars. Wait’ll they see what I got them this year. 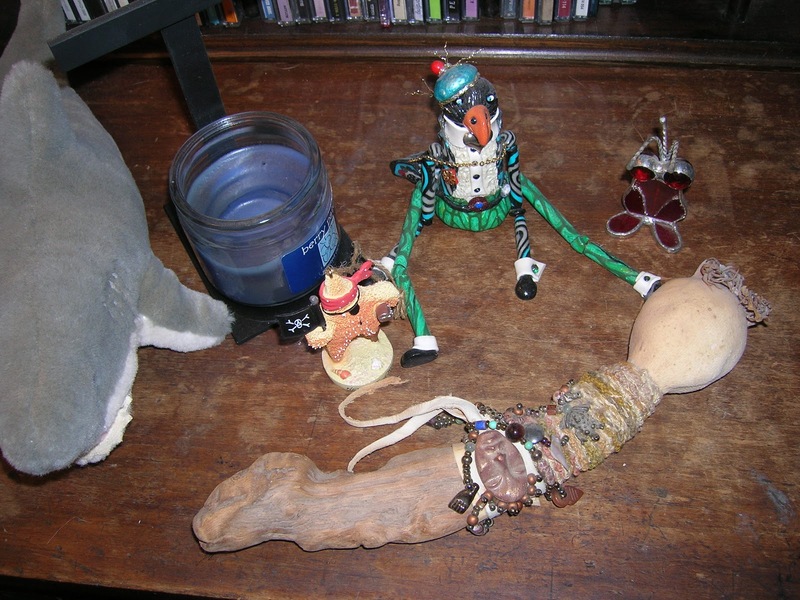 The photo above shows some of my own treasures that came from past bazaars.